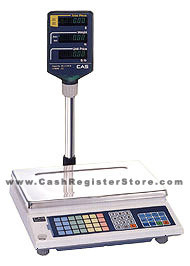 CAS AP-60 Electronic Weight Scales at Cash Register Store.com. The CAS model AP-60 price computing scale comes with a full load of features. Some features included are a stainless steel platter, and a flat spill resistant keyboard. The customer and operator display are located atop a pole for easy viewing by customer and operator. Front and rear bright LCD easy to read displays feature the unit price, weight and total price. The AP-60 has an optional large platter that can be added for multiple or large items that normally would not fit on smaller platters. Other features include Zero, Tare, Tare Save, PrePack and 200 price look up's with 28 preset keys for fast lookup of common prices.